If there are any questions, please don’t hesistate and get in touch! If you can't find something to immediately interest you, please take a look at GSoC 2009, GSoC 2010, GSoC 2011, GSoC 2012, GSoC 2013, GSoC 2014, GSoC 2015 and GSoC 2016 project ideas pages for other inspiration. Each sponsored GSoC 2017 project will have one or more mentors available to provide a guaranteed contact point to students, plus one or more technical advisors to help applicants with the technical direction and delivery of the project (often the original author of a tool or its current maintainer, and usually someone recognised as an international expert in their particular field). Our Google Summer of Code organisational administrators will also be available to all sponsored GSoC students for general advice and logistical support. We'll also provide supporting hosted project infrastructure, if required. For all questions about the Honeynet Project, the GSoC program or our projects, please contact us on gsoc-slack.honeynet.org (preferred) or email us directly at [email protected]. Port Independent Protocol Identification Library: Go Library that can be attached to a network stream to identify the protocols in use. Holmes Example Services: Develop four example programs that demonstrate how to develop services for executing static and dynamic analysis. Cuckoo Sandbox - malware analysis system. Conpot Protocol on Steroids: Read RFCs, implement them, catch bad guys! SNARE/TANNER: Make our web application honeypot attract new sorts of maliciousness. HoneyThing: Attract Mirai and other botnets with the TR-069 honeypot. Library that can be attached to a network stream to identify the protocols in use. We are currently developing a protocol agnostic honeypot  and use a port to protocol mapping to choose the correct connection handler. This is obviously a very simplified approach and we would like to be able to assume arbitrary protocols on any port. With that assumption, we need means to identify the protocol used in a network stream. There are various papers around the different identification approaches . We assume the most efficient approach would be a layered architecture where we start with cheap and quick pattern matching before deploying more expensive measures (e.g. heuristics, statistics, machine learning). A good starting point would be getting familiar with packet manipulation using Go. The gopacket library is an excellent tool for that purpose. The wireshark wiki has an exhaustive collection of labeled pcap samples, excellent for testing a signature or training a model . There are implementations of this problem that go into the right direction . We have a couple of feature requests for mitmproxy that would make really great additions to mitmproxy, but haven’t been tackled yet. This project would consist of multiple “mini-projects” spanning from a few days to multiple weeks, allowing you to work on isolated tasks at different parts of the code base. "Map Remote Editor": Other proxies have a feature which maps one URL to another, e.g. one can map https://example.com/foo.js to a local file that is served to the client instead. It is easy to write a mitmproxy script that does this, but we want this to be a built-in feature! Fun fact: This task was initially proposed by our last year GSoC student in issue #1454! Mitmproxy currently supports four different protocols: HTTP/1.x , HTTP/2.0, WebSockets, and a raw TCP mode as fallback for everything else. WebSockets and TCP are new additions that are not exposed in the UI yet. 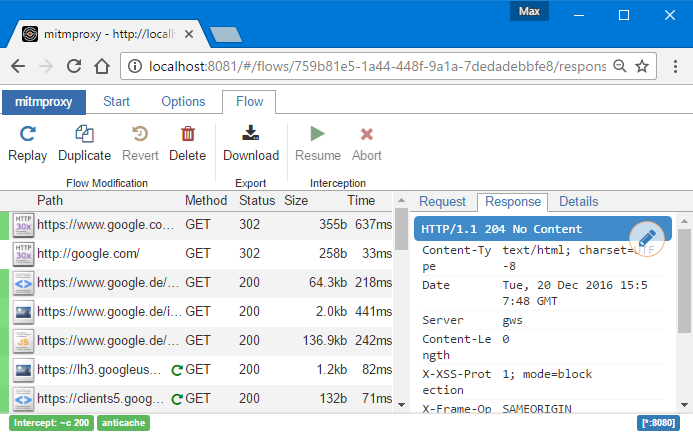 One project would be to display WebSocket connections in the mitmproxy flow list, and allow users to view all exchanged WebSocket frames. We currently depend on the watchdog library to watch the filesystem and reload mitmproxy scripts automatically. Due to numerous bugs in watchdog, we have restricted ourselves to using only watchdogs's PollingObserver over time. Watchdog now is a large dependency with platform-specific binary components and multiple subdependencies which we do not really use, so we want reimplement the very small subset that is needed for mitmproxy in pure Python. This makes mitmproxy smaller and we don't have to worry about watchdog breaking mitmproxy installations anymore. 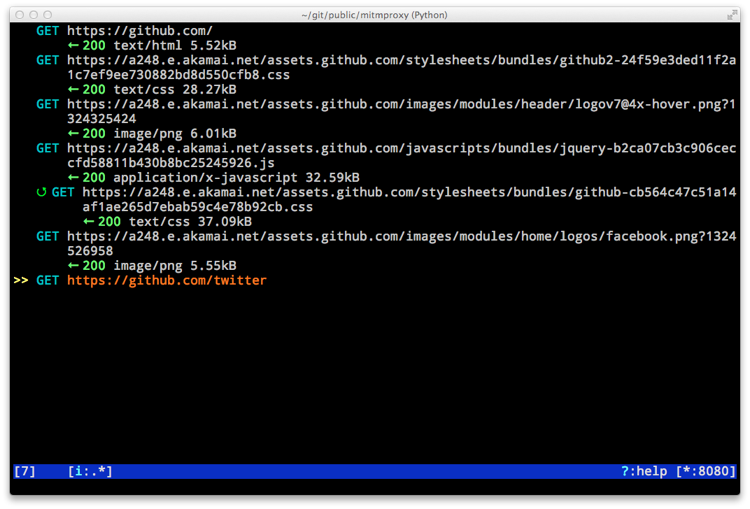 Mitmproxy already supports streaming of responses back to the client. However a commonly asked feature is to also support request streaming, e.g., large file uploads from a client to the server. Recent changes in the core should make this feature pretty straight-forward to implement. The mitmproxy project is keen to foster an addon ecosystem. This means that we need a clean, usable way for users to discover and install modules not bundled with mitmproxy itself. The next step for mitmproxy is to work on higher-level functionality like security scanners, reconnaissance tools and end-point discovery mechanisms. If you have a neat idea that is central enough to belong in the mitmproxy core, pitch us on it. Mitmproxy’s console interface can be improved in many areas - we have plans for a modal interface, configurable key bindings and other improvements. See here for details on how to get started. We encourage you to also think beyond the features listed above - what would *you* do to improve mitmproxy? Spend the summer improving mitmproxy’s web interface! Last December, we shipped the first version of our web front-end “mitmweb”, which finally brought a graphical user interface and Windows support to mitmproxy. Mitmweb is largely based on last year’s GSoC work and currently only supports mitmproxy’s most important features. Our long-term aim is to achieve feature-parity between the web-interface and the console application. The goal of this project is to add some major mitmproxy features to mitmweb, ideally with a better UX than what the console interface provides. For example, one part of your project would be to implement a replacement editor so that users can define rules to automatically modify requests and responses. Another aspect we’d like to tackle is traffic visualization. While we have a good idea of further features that we want to see implemented, the first task for your application is to try out mitmweb and make a rough list of ideas/features how you would improve mitmweb to show us that you understand the product. We’ll then mix that with what we have in mind and create a great project plan for the summer! Mitmweb is based on a modern web app technology stack (React.js, Redux.js, ES6, Bootstrap, Gulp, ...), so you can work with the latest technologies and focus on good code rather than IE support.